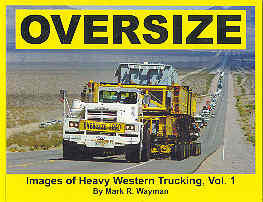 OVERSIZE is photo gallery of over dimensional loads that move throughout the Western United States. Over dimension loads are normally overwidth loads, overheight loads, overlength loads or overweight loads. This book features some of the trucks, trailers and equipment that are needed to move these over dimensional loads. This book also features some of the companies who operate the specialized equipment needed to complete the job safely, economically and on schedule. Some over dimensional movements require years of engineered planning and not only deal with the logistics of moving the specialized cargo but may also deal with interstate transportation of the cargo as well as the permitting that is required to move that load in the individual states involved. The trucks in this book are truly an awesome sight to behold as they earn their keep safely moving heavy OVERSIZE loads to their final destination.